I am trying to automatically create several hammocks whose start will be defined by early use of a given resource and its finish will be determined by the late finish of the resourceuse by its predecessors SS/FF. The resource FM1 TO FM10 will be allocated using skills and will vary when changes in duration of other activities occur. I want to be able to model such variations automatically in a Monte Carlo simulation as to explore the cost probabilities. If using 9 Freezing Machines the deterministic cost will be less but the float availability will also be less, I suspect the option for 10 Freezing Machines will be a better choice. In order to compare the results if using different probability distribution curves, lognormal vs. triangular a model for each scenario was issued. The following diagram summarizes the results. The cumulative distributions to the left represent models using lognormal distribution while those to the right represent models using triangular distribution. Using 9 FM [Freezing Machines] is the best deterministic option while using 10 FM is the best among lognormal options set and the best among triangular option sets. Consider planning for 10 FM as the "best" option. Thanks Vladimir, so easy no instruction needed, a single click of the mouse for every version you want to add. I am used to the name S-curve applied to cumulative cost. By the way Spider Project can also show probability curves of any number of versions of the same project simultaneously. Keep in mind these are probabilities S Curves from Monte Carlo run with ASAP as a general rule. And yes it will include about 6 scenarios. I have always been curious about comparing success probabilities curves of different scenarios and Spider gives me all the tools I need as-is. 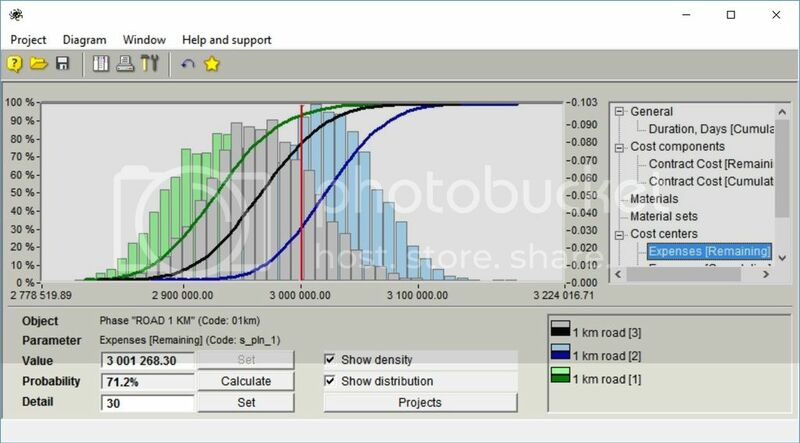 I never expected for it to be at a single click of the mouse as if using report templates for deterministic S-Curves, so easy I rarely use templates for such simple task. It was on the modeling of the "resource hammock" in a dynamic way for Monte Carlo as to automatically adjust staffing and their costs that I was stuck. I do not believe this is possible with software like P6 or MSP. To me this makes the exercise twice as interesting, not to mention the need to model spatial resources something for sure neither P6 or MSP can do. In the exercise statement I said - If using 9 Freezing Machines the deterministic cost will be less but the float availability will also be less, I suspect the option for 10 Freezing Machines will be a better choice. Well it is starting to look like option for 10 Freezing Machines will be a better choice. Any two versions (scenarios) early and late S-curves may be shown in standard Spider report, but not many scenarios simultaneously. Spider exports to text and directly to Excel. Eventually all scenarios S Curves will be plotted, the following only includes 2 scenarios. Wee will be able to see how off-set the curves are as well as the intersection points, if any. It is not difficult to export the distribution data and get descriptive statistics. From the data you shall be able to plot on same chart the S curves of various schedule versions for comparison purposes. The display of the charts is great but the ability to export the data opens up the possibilities for further analysis. Vladimir, deterministic models as well as probabilistic models are coming out as expected but a few more are needed. For the moment I am somewhat busy and will take me several days to create the others even if using current models as templates. In addition P85 value can be another metric of concern. Using the "resource hammock" as to model resource staffing that will include idle time cost. Using spatial resource model instead of fixed logic that wont necessarily do it in Monte Carlo run. This exercise is based on the classic scheduling problem for the Westerscheldetunnel. I will cross reference this discussion into Lets Challenge Spider in due time. WOW your solution works beautifully, so good that I found an error in one of my manually defined hammock for FM10. I used a minor adjustment to the following formula for a deterministic test schedule. For a re-schedule/update of the deterministic schedule the formula must be executed manually or by script before schedule calculation, something I believe can be a formula option. Latter on will work on the Monte Carlo run, but the test is a proof it will work as good. Sorry for the duplication - one of previous two posts may be deleted. Rafael, I enjoyed your task. It deserves to be put in "Let's challenge Spider" discussion. It is pity that this discussion does not continue. It can be done using formulas and certain procedures. I understood that you wanted to create hammocks for modeling costs that depend on the elapsed duration of Freezing Machines use. 1) Create project activities with codes FM01, FM02, ... with zero duration and of duration type. 3) Create User Field with code R (or any other) and enter R (or other text) in the cells of this field at activities FMo1, FM02, etc. rows. Spider Project will apply first two formulas after calculating project schedule and will set starts and finishes of "resource" activities (FM01, FM02, etc.) equal to starts and finishes of corresponding resource usage. Then it calculates project cost and then makes "resource activities" duration equal to zero. This will be done in every Monte Carlo iteration and you will get all required probability distributions. And please download the latest version where we fixed minor error in Monte Carlo simulation. Assigning Resource to Hammock Activity?